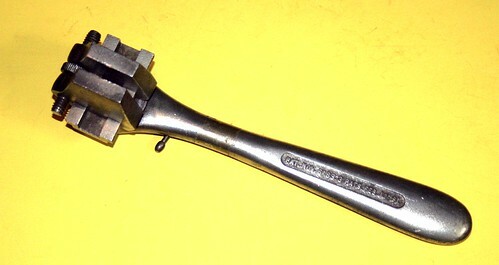 Here's a ratchet patented by Keystone Mfg. Co. of Buffalo, New York, in November, 1883. Always looking for what interests me, anything early Dodge Brothers/Graham Brothers trucks ( pre 1932 or so ) and slant six / Super six parts. There is a spring loaded pawl in the handle that engages the open gear you see on the top. The lever shown changes the direction. On the other side is a set of jaws that can be opened or closed by a thumbwheel to fit the fastener. Not very practical on hex nuts, it was used on the old square nuts and bolt heads. That is one BA ratchet! Me and the Dog don't miss no meals! Just not quite as nice! Yep. Some of the old designs are showing up again, but that looks like the old "buggy wrenches", and I bet it doesn't work very well. I wouldn't buy one, I saw it at lowes. Check that video out, lol I love when they say "Throw away that socket set"! Wow, what a magnificent ratchet. Do you still have it Papaw? Also, I'm curious why in the thread title why you referred to it as a "wizard" ratchet? Is it somehow related to the Richards Mfg Co. Wizard? I had two of them aand sold one. Not sure where the other is right now. 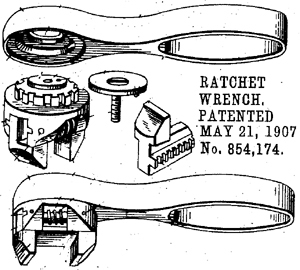 Charles H. Meyers first patent was issued November 6, 1883, patent 288,098, subsequent patent 446,073 was issued February 10, 1891 as well as patents 446,072 and 446,075 that are for other attachments for the ratchet. It had drill attachments and different handles for the drill attachment. This isn't part of the Richards Wizard Ratchet Wrench patent. They made at least 3 different sizes, 9", 11" and 13". I'll have to dig my pictures up, I have 2, 9" ones with different attachments. Ah, okay thanks. The course ratchet mechanism on both wrenches looks pretty similar, but the jaw size adjustment is different. I've never handled one of the Keystone's in person, but the single thumb-screw adjustment looks quicker and easier than the Wizard with it's double-worm adjustment.